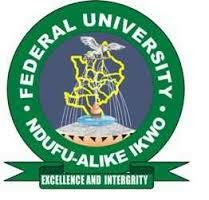 Federal University Ndufu-Alike, Ikwo (FUNAI) Supplementary Post-UTME Screening Results for 2018/2019 Academic Session Successfully Released Online. This is to inform all students who applied for the Supplementary Post – UTME Test of the Federal University Ndufu-Alike, Ikwo (FUNAI) that the results has been released for 2018/2019 academic session. Prospective candidates can follow the outlined procedures to check and confirm their results/screening scores.